Remy Ryan wears red high top Converse “Chuck Taylor” All Stars in the film. The people of Cadillac Heights fight back against the takeover of their community. The war against crime in pseudo-future Detroit worsens. Robocop (Robert John Burke) and Officer Lewis (Nancy Allen) are still taking down Reagan-era street criminals, while 80s corporate corruption goes unabated. The Detroit PD, privately owned by Omni Consumer Products, is still on the verge of going on strike. We open with a seige on Cadillac Heights. Precocious tech wiz Miko (Remy Ryan, Monkey Trouble) watches her parents get evicted by the evil McDaggett (John Castle) and his REHAB unit. Having nowhere else to go, Miko ends up a part of the rebellion led by Bertha (CCH Pounder) that includes Moreno (Daniel Von Bargen) and Coontz (Stephen Root). Their first raid is on a munitions depot, guarded by an ED-209, that includes Robocop’s prototype jetpack and super-gun. Lewis and Robocop (a.k.a. Murphy) take the call, but it goes badly and Lewis and Murphy have to fight off a gang instead. Miko wanders through the ruins of her neighborhood. Meanwhile, The CEO of OCP (Rip Torn) is negotiating a merger with Kanemitsu (Mako), who sends his own cyborg, called Otomo (Bruce Locke), to help sort things out. Dr. Lazarus (Jill Hennessy), who works on Robocop’s body, ignores an order from corporate weasel Fleck (Bradley Whitford) to install a chip that would erase Murphy’s emotions and memories. Irrelevant to the plot, but it shows that Lazarus is an ally. Murphy and Lewis next investigate the rebels in Cadillac Heights when McDaggett shows up. Robocop has a dilemma as two of his prime directives would have him aide REHAB, but he ignores it, knowing right from wrong. For some reason, he still has Prime Directive 4, which forbids him to act against an OCP officer. (That’s not a nitpick. It was a key plot element of the first film that was resolved!) When Lewis is killed, Murphy goes rogue. Miko escapes from the REHAB unit enforcers. 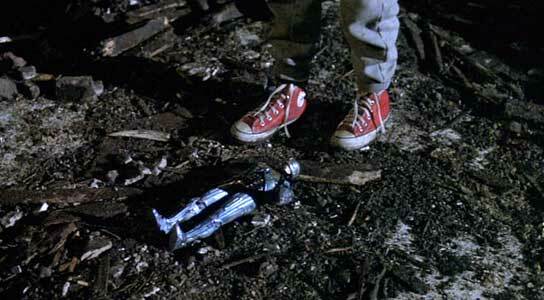 Robocop is badly damaged, so the rebels, namely Miko, reach out to Lazarus, who agrees to help. As Otomo gets closer to the rebels, Robocop, repaired, remembers Lewis’s last words and goes after REHAB, torchcing their offices and such. After McDaggett’s spy is revealed, there’s a chase where Robocop commandeers a pimpmobile. The rebel hideout is seiged. Bertha is killed. Lazarus is kidnapped. Miko escapes with her laptop. When Robocop gets back, Otomo is waiting. The cops refuse to help REHAB evacuate Cadillac Heights, and finally go on strike to defend those citizens. Things seem pretty grim. In a final battle, the film finally jumps the shark by having Robocop in his jetpack flyover the battle and help the rebels and cops easily defeat REHAB on his way to confront McDaggett and save Lazarus and Miko. Justice is served, OCP’s stock is worthless, and everyone is saved. It’s even sunny out. 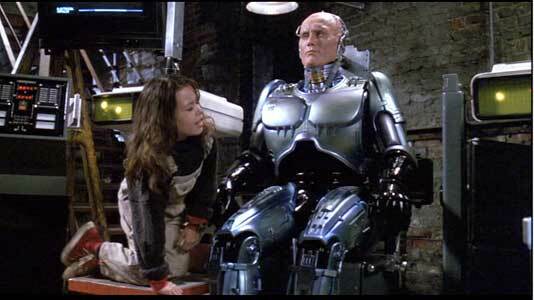 Miko talks with the damaged Robocop. 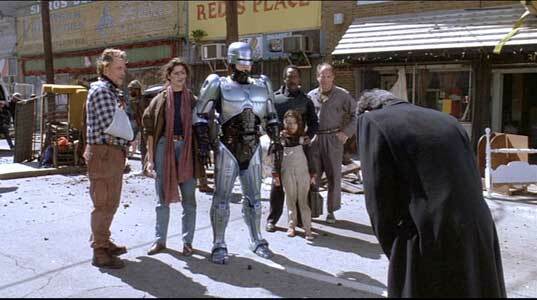 Robocop 3 is a weak, but not entirely awful, production. It’s silly and uninspiring. It’s makers knew they had something unimpressive. Made in 1991, it wasn’t released until 1993. It’s obvious why. It just looks half-hearted, like everyone shrugged and just got it done. Robert Burke’s stiff impression of Peter Weller keeps you at a distance. We really need that hint of humanity he brought here, with such a goofy, comic book style tone. You just won’t care about the hero. Nobody will be impressed by the f/x. Also, the 80s were well over and done with by 1993, so it’s hardly relevant. The rest is so rote it’s boring. The best thing about the film is Basil Poledouris’s score, which is just recycled from the first film. Also, Miko is adorable. Frank Miller said writing Robocop 2 and 3 was such a miserable experience it made him want to do a story so violent and stylistic it could never be made into a movie. That idea became Sin City. Dr. Lazurus helps Miko escape from the bad guys. 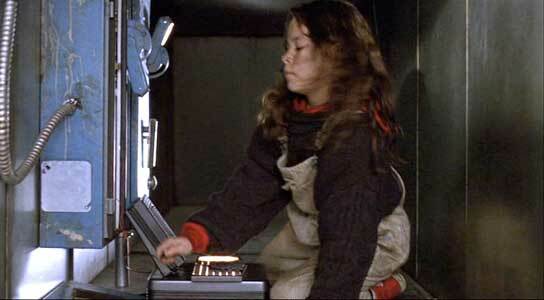 Miko get into the ventilation system at the Omni Consumer Products headquarters. 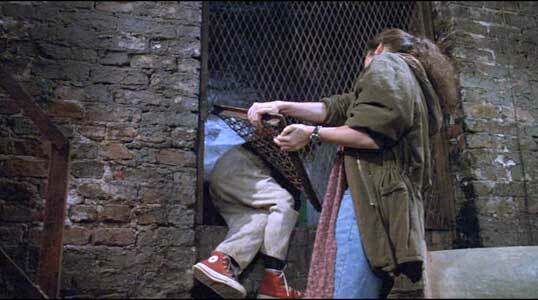 Throughout the film, Miko wears red high top chucks, like all young geniuses. (Converse Athletic Shoes also get a Special Thanks in the end credits.) Robocop, damaged in a shootout with REHAB, looks up to see Miko, his biggest fan, standing over him in awe. Miko working her magic on her computer at the OCP headquarters. 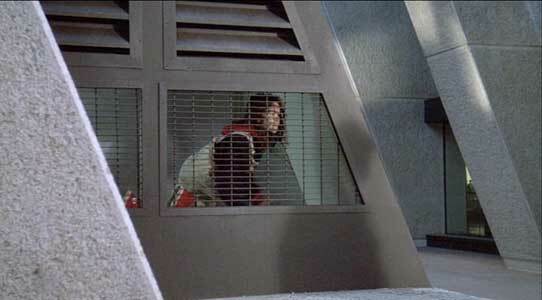 Later, intrepid Miko sneaks around in OCP’s man-sized air vents, patching into their video network and using her tech skills to find Lazarus. She then gets to work reprogramming Otomo to destroy its undamaged double, Otomo 2. 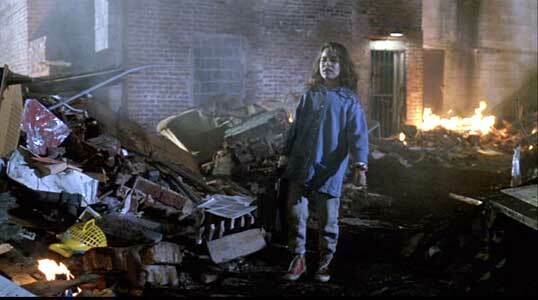 Remy finds a Robocop action figure in the rubble. Robocop 3. (1993) Robert John Burke, Mario Machado, Remy Ryan, Jodi Long, John Posey, Rip Torn, Jill Hennesey, Mako, John Castle, S.D. Nemeth. Directed by Fred Dekker. Categories: Crime, Action/Adventure, Science Fiction/Fantasy.